↑ This manuscript may have been produced in India during the 17th century. The page provides a praise of God as an appropriate incipit to the text. The first two lines read: "In the name of the Lord، Life-Creating، / The Wise One، Speech-Creating with the Tongue، / The Lord، the Giver، the Hand-Seizing، / Merciful، Sin-Forgiving، Excuse-Accepting." This page is typical of the first page of Persian poetical texts، with an ornamental panel at the top (sarloh) and the main text decorated by cloud band motifs and decorative illumination between the text and in the gutter separating each verse of poetry. 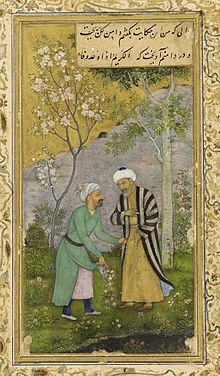 ↑ "گلستان سعدی، باب اول، تصحیح محمدعلی فروغی". Dibache.com. http://www.dibache.com/text.asp؟cat=3&id=1338. Retrieved on 2012-08-13. ↑ بوستاں سادی. باب 1 (انصاف، عقل اتے حکومت تے)، دشمناں نال سلوک بارے. ↑ "سادی دی بوستاں". The Internet Archive. https://archive.org/details/hikayatesaadibyibnealisheikhsaadi-121207041924-phpapp02. Retrieved on 18 July 2016. The Golestan of Saadi, translated by رچرڈ فرانسس برٹن, 213 p., Iran Chamber Society (PDF).